1 Henry Tolman & Co.
1 L. Prang & Co.
1 New England Music Co.
3 Oliver Ditson & Co.
composed for the piano forte by William Wolsieffer. "In memory of a country's martyred father"--Cover. "To the Hon. A. Lincoln"--Cover. words by Hosea Bigelow ; music composed by F. Boott. Black and white lithograph of Uncle Sam and John Bull facing each other across boundary. words by W. S. Blanchard ; music by L. B. Starkweather. Decorative t.p. / Geo. F. Swain. Also published in an ed. for brass band. Arranged for the piano by a soldier. "Respectfully dedicated to the Confederate Generals"--Cover. composed for the piano by Geo. E. Fawcett. 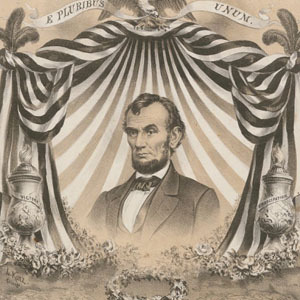 "Dedicated to Abraham Lincoln, a foe to tyrants and my country's friend"--Cover. "To the Republican Presidential Candidate"--Cover. Caption title; imprint, etc. from t.p. The present work is no. 25 of the series.